Habit: Annual 2--4 dm, short-appressed- and long-spreading-hairy. Leaf: petiole 3--4 cm; leaflets 7--11, 15--30 mm, 2--4 mm wide, linear to oblanceolate, adaxially hairy at least near margins. Inflorescence: 15--20 cm, flowers spiraled, occasionally appearing +- whorled; peduncle 2--4 cm; pedicels 2--4 mm; bracts 3--5 mm, < buds, generally deciduous. Flower: generally 10--12 mm; calyx 3--6 mm, lips +- equal, upper deeply lobed; petals generally blue (+- pink), drying darker, banner spot +- white, in age magenta, keel lower and often upper margins ciliate near claw. Fruit: 1--2 cm, +- 5 mm wide, coarsely hairy. Seed: 4--5. Unabridged Note: If recognized taxonomically, plants in southwestern SCo (flowers +- pink, leaflets truncate) assignable to Lupinus sparsiflorus subsp. inopinatus (C.P. Sm.) Dziek. & D.B. 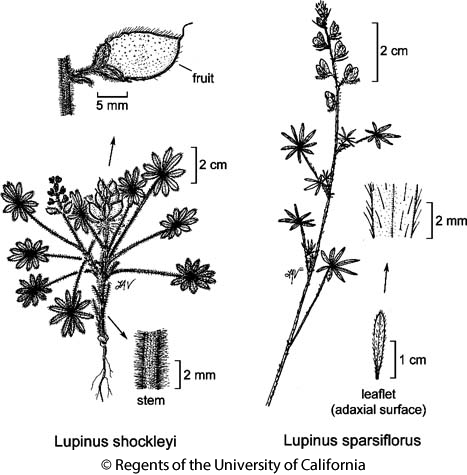 Dunn; plants in DMoj (flowers often smaller) to Lupinus sparsiflorus subsp. mohavensis Dziek. & D.B. Dunn. Citation for this treatment: Teresa Sholars & Rhonda Riggins 2012, Lupinus sparsiflorus, in Jepson Flora Project (eds.) Jepson eFlora, http://ucjeps.berkeley.edu/eflora/eflora_display.php?tid=32087, accessed on April 25, 2019.
s SCoR, SW, DMoj; Markers link to CCH specimen records. Yellow markers indicate records that may provide evidence for eFlora range revision or may have georeferencing or identification issues. Purple markers indicate specimens collected from a garden, greenhouse, or other non-wild location.